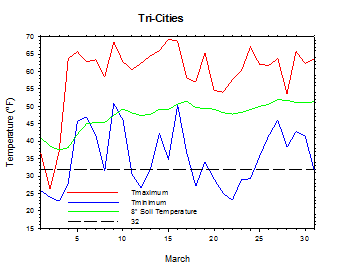 Despite a brief period of cold at the beginning of the month, most of March was quite mild. The high temperature on the 1st was only 19 degrees at Green Bluff, but conditions quickly warmed thereafter. Vancouver reached 62 degrees on the 3rd, and some areas experienced low temperatures in the low 50s by March 5th. A very active early period brought significant rainfall to western areas. In fact, Montesano received 7.73 inches of rain from March 2nd to 8th. The remainder of the month was characterized by alternating periods of drier and more unsettled weather. Western Washington was generally wet, as Long Beach recorded only 5 dry days in the month. Unfortunately, a major landslide struck Oso on March 22nd, leading to significant loss of life and property destruction. 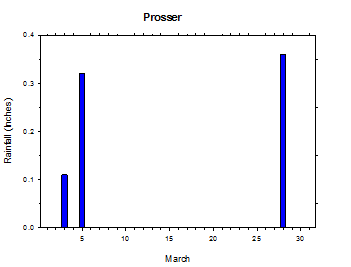 By contrast, rain fell on only 3 March days at Prosser. 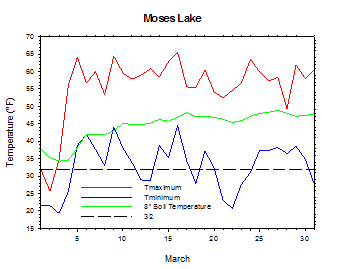 On March 15th, Mabton East reached 72 degrees, while 21 Acres (near Seattle) peaked at 73 degrees on the 24th. However, clear and calm conditions allowed Moxee to drop to 19 degrees on March 22nd. 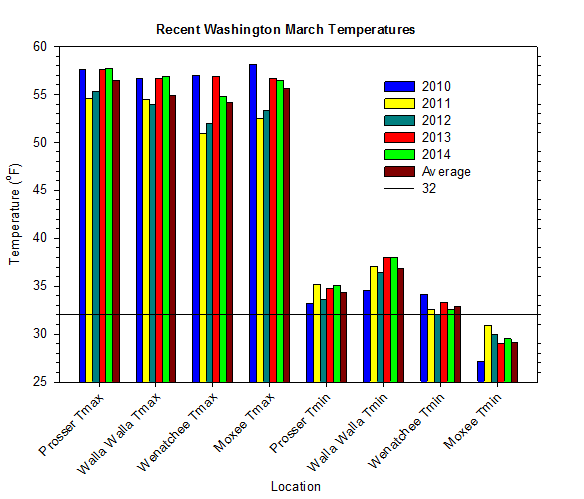 Still, there were few large temperature swings during March, especially in eastern Washington. Monthly temperatures were generally 1 to 2 degrees above average, although Mt. 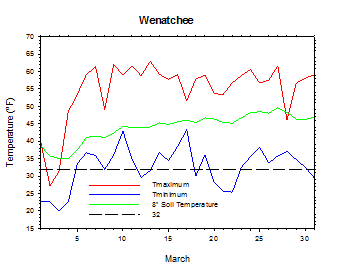 Vernon's mean March low was nearly 3 degrees warmer than normal. Overall, mountain snowpack remained near normal at month's end, although potential concerns of an early melt off or a very dry spring remain valid at this time. March began with unusually cold air pouring into eastern areas. Highs on the 1st ranged from 54 degrees at Tokeland to 19 degrees at Green Bluff, with lows varying from the teens and 20s in the east to the 30s in the west. However, an active pattern quickly set up on March 2nd, with snowfall changing to rain in many areas. Highs were mainly in the 20s and 30s in the east, and 40s to low 50s in the west. 1.1 inches of rain fell at Montesano, while wintery precipitation occurred in the east, and heavy mountain snow forced the closure of Snoqualmie Pass. Additional rain fell in the west on the 3rd, as the eastern cold pool finally mixed out thanks to gusty south winds. Highs on the 5th ranged from the mid 60s to around 70 degrees in the south to the 40s in the north, while lows varied from the 40s to low 50s in the south to the 30s in the north. Every AWN site received at least some rainfall, including 2.19 inches at Stevenson. Conditions dried out by the 11th, as high pressure built into Washington. Lows were briefly cooler in the drier regime, although days were sunny and mild. Highs on the 11th ranged from the upper 40s in eastern border areas to the low 60s in central areas, while lows varied from the upper 20s to the low 40s. Highs on the 16th were in the upper 40s to upper 60s, with lows in the 30s to around 50 degrees. Strong west to southwest winds were observed, as 1.64 inches of rain fell at Snohomish. 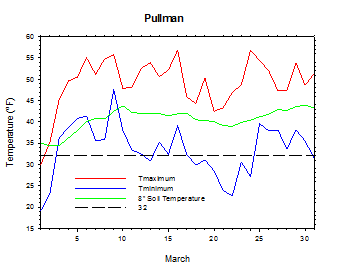 Showers persisted on the 17th around Pullman and Walla Walla, as strong westerly winds of up to 30 mph were recorded. Morning temperatures on March 20th dropped into the 20s in many areas, including 21 degrees at Moxee, but then rebounded into the mid 40s to mid 50s by afternoon. Highs on the 23rd reached the 50s to low 60s, with lows in the mid 20s to 30s. A wetter pattern arrived on the 25th, and continued for the remainder of March. Highs were in the 50s to mid 60s, with lows in the 30s to mid 40s in the east and mid to upper 40s in the west. 0.59 inches of rain fell at Stevenson, and most of western Washington received some rainfall. High temperatures on March 26th ranged from the upper 40s to low 60s, as lows were in the upper 20s to mid 40s. 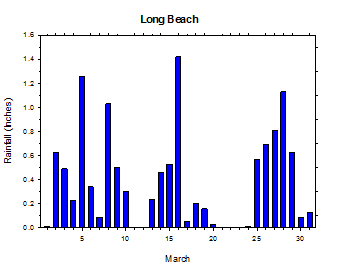 0.69 inches of rain fell at Long Beach, as moderate south winds were observed in many areas. Low temperatures on the 31st ranged from 21 degrees at Broadview to 44 degrees at Tokeland, while highs were in the 50s to mid 60s. 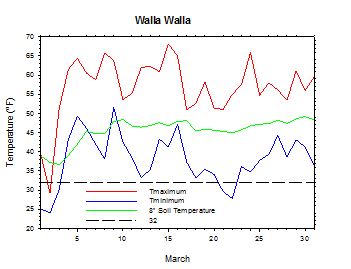 The average March temperature at Prosser (WSU IAREC) was 46.5°F, which is 1.1 degrees above average. The average high temperature was 57.7°F, which is 1.2 degrees above average. The average low temperature was 35.1°F, which is 0.8 degrees above average. The maximum temperature recorded last month was 66.7°F on March 9th, while the coolest daily high was 26.3°F on March 2nd. 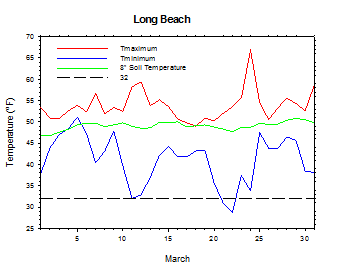 Low temperatures ranged from 50.2°F on March 9th to 23.8°F on March 2nd. Daily average temperatures ranged from 59.2°F on the 9th to 25.0°F on the 2nd. The monthly precipitation total was 0.79 inches. 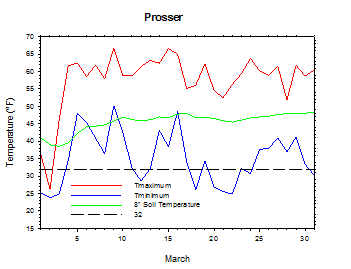 The average wind speed was 6.6 mph, and the average 8 inch soil temperature was 45.6°F. Mt. 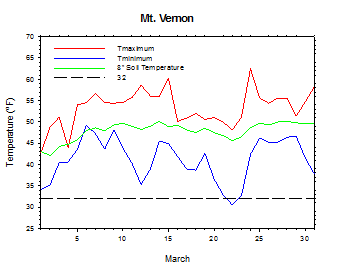 Vernon recorded an average temperature of 46.8°F, which is 2.0 degrees above average. March 5th: 2.19 inches of rain fell at Stevenson. March 15th: The temperature at Mabton East reached 72 degrees. 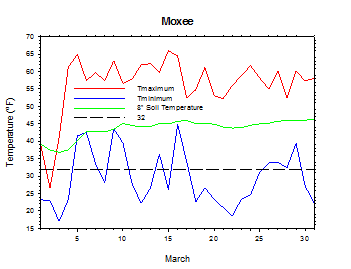 March 22nd: The temperature at Moxee fell to 19 degrees. March 24th: The temperature at 21 Acres climbed to 73 degrees. The growing season slowly sprang to life during March. Pest control sprays were applied to some pears in Okanogan County, while fruit tree pruning was completed in Yakima County, as most trees experienced bud swell and even blossom color. While Whatcom County berry growers were concerned about potential root rot due to wet conditions, Columbia County soil moisture levels continued to run below normal (National Agricultural Statistics Service). 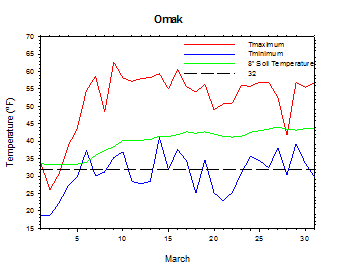 On March 1st, 1993, the temperature at Moxee plunged to 9.7 degrees. According to the Climate Prediction Center, above average temperatures are likely through the autumn of 2014, along with below average precipitation during the late spring and early summer. El Niño conditions will likely begin to develop in the coming months.